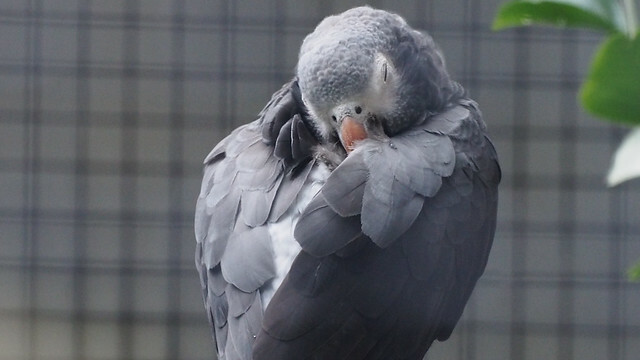 Sleep - How Much Sleep Do Most PARROTS Need? I, like most people, was first attracted to parrots because of the beautiful colors and the ability to mimic different sounds. The more sounds these beautiful beings were able to make it seemed the more attracted to them I had become. I am still amazed how smart these "Angels with Wings" really are. One of the most crucial things for a pet owner to realize is the amount of uninterrupted sleep a parrot needs. While most of the waking day is spent playing, grooming, foraging and finding interesting things to get into, the Parrots although not realized by most, do spend times asleep. A.) Electroencephalography (EEG) - a test that measures and records the electrical activity of your brain. B.) Electromyography (EMG) - a test that measures the electrical activity of muscles. C.) Electrooculography ((EOG) - a test that measures eye movements. These three testing procedures have been conducted on several species of parrots and parakeets, including the Half-moon Conure and the Budgerigars are known commonly as Budgie. As in Humans, Birds have been found to have two major forms of sleep. 1) SWS - Shown in a test as slow high voltage brain waves. This stage of sleep appears to be the most important because of the restorative functions of the mind and body. 2) PS - (Paradoxical Sleep) in test show low voltage brain waves similar to those of being awake. These low voltages are often associated with movement of the eyes (REM). In humans, dreaming happens during the Paradoxical Sleep stage. It has been suggested that PS may be associated with brain development and learning. Out of all the parrots studied PS stage was always preceded by SWS. It has also been noted that the Parrots spent a shorter time in PS stage than most mammals or any other avian species. It should be noted, the studies could be ruled inconclusive since the test was conducted under lighted conditions. Although even under lighted conditions it was found that the Half-Moon Conure spent 57% of a 24hour period in a sleep state (SWS or PS).Budgies were 38% of the same time in a sleep state. 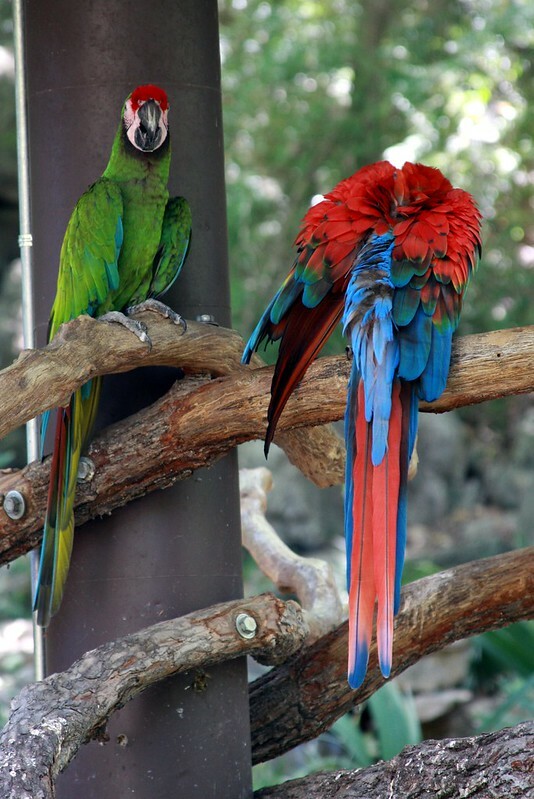 An interesting sleep stage was also recognized in the parrots which are referenced as Unihemispheric slow-wave sleep (USWS). Which is the ability to sleep with one half of the brain while the other half remains alert? This is often associated with migrating birds that travel long distances is believed to go into this form of sleep. This form of sleep is also a form of protection while one part of the brain sleeps the other part is alert for predator detection. In the wild, Parrots normally sleep in groups known as flocks. The flocks are typically found sleeping in close proximity of the feeding areas. Parrots are much like people when it comes to sleep. Without the proper amount of sleep, parrots can be irritable. Several behavior issues can be associated with the lack of sleep which could include biting, plucking, screeching, throwing food and being generally destructive. How much sleep does a Parrot need? A general recommendation is at least 10 to 12 hours of darkness for rest. When preparing for spaces for your new Parrot keep in mind of the need for quite a dark atmosphere during sleeping hours. Keeping in mind of your Parrots need for sleep will help you and your Parrot have a more fulfilling companionship. Feather plucking is known to be a very nasty habit of the African grey parrot. They are notorious feather pluckers. It is said that the Timneh African Grey parrots are not as bad as the Congo African Grey Parrots when it comes to feather plucking. But this is not a proven fact. First of all, any parrot keeper should ask himself why do parrots pluck their feathers. There are many different reasons for this nasty habit. The African grey parrot is a parrot species that need quite much attention from his human owner. If this doesn't happen then the bird will probably get bored and this can result in feather plucking. But believe me that this feather plucking problem is very complicated because it's very hard to resolve it. There were cases when the African greys plucked their feathers because of getting too much attention. So you just don't know exactly how to treat your bird. Dietary imbalances or environmental problems may also take to feather plucking. Some environmental problems could be smocking very much in the room where the parrot is kept or keeping him in a space with dry air. Also is recommended for African grey parrots to get regular baths or to be exposed to some kind of moist air. The African grey parrots shouldn't encounter any frightening experiences because this can take to feather plucking. If this nasty habit appears in your bird's daily activities than you should first see a veterinarian. He will probably try to find a physical explanation for the bird's problem. It's best to try to understand what the veterinarian explains and try to find some ways of resolving the problem. It is proven that the African grey parrot is the most intelligent species. His higher degree of intelligence, along with possible incorrect early socialization at the breeders and not understanding the bird’s intellectual needs when it becomes a companion parrot often leads to neurotic habits -- such as plucking. 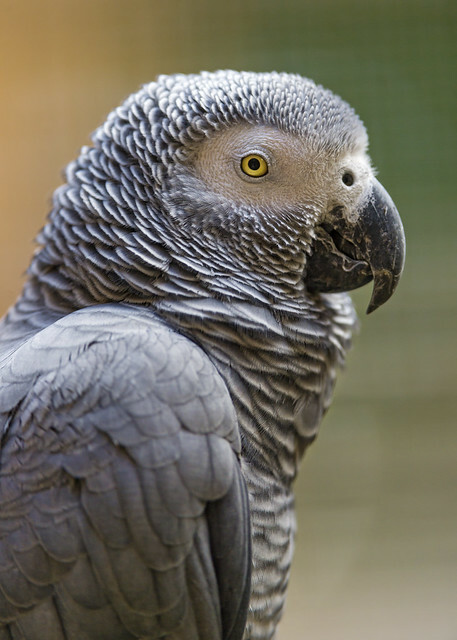 Timnehs African grey parrots don't pluck their feathers as much as the Congo African grey parrot. This could be because they were not as popular as the Congo African parrot. Because of their duller coloration, they weren't as licked as the congo. In conclusion, the feather plucking is a major problem for the African grey parrots because they are very difficult birds to take care of. Blood can be well, disgusting to deal with. Nothing is more heart-wrenching or perhaps nerve-wracking to find your bird suddenly has an injury that is bleeding and needs to be dealt with immediately. If your bird started bleeding right now, would you know what to do? Because birds are small, a seemingly low amount of blood loss to us can mean a major loss to them. When handling a bird to control bleeding, a good restraint technique is important to ensure that the bird is being immobilized, while not getting overheated. Holding the bird in a towel or small blanket will help immobilize and calm the bird. Breaking a blood feather is not uncommon, especially in the species that tend to be rough, like caiques. Feathers are delicate when growing in, and because a new feather does have a blood supply, can bleed quite badly. When trying to stop bleeding on a blood feather, do not apply silver nitrate or commercial aids like kwik stop, as these products can actually damage the feather follicle. Apply pressure to the area and wait. If the bleeding stops, observe the bird carefully. Depending on the location of the feather, you may want to pull the feather to prevent future issues. If you are not comfortable with pulling the feather yourself, take the bird to your local avian vet so they can show you the proper procedure. You can apply a commercial aid such as silver nitrate stick, or kwik stop to the area with pressure until bleeding has subsided. Silver nitrate and kwik stop are clotting agents that will help slow the blood flow. If you don't have these products on hand, you can also apply cornstarch or flour to the area, as these home remedies also will help clot. It does happen. On more than one occasion my clumsy caique has bonked his beak on something, cracked the very tip, and caused some blood flow. In this case, you want to apply pressure, corn starch, or flour. Avoid agents like kwik stop, as they will cause a burning sensation, and a bird's beak is very sensitive. Once the bleeding has stopped, apply something like Nu Skin, or another form of liquid bandage over the area to help protect and seal the wound. Once the bleeding has stopped and the bird is stable, the bird should be assessed by your avian vet to see if other precautionary measures need to be taken. Beak injuries are painful, so offer your bird a soft diet alternative until the injury has healed and the bird is able to resume a normal diet. In the situation that your bird is bleeding from the vent, rush to your local vent immediately. Bleeding from the vent can stem from a number of causes including egg binding, polyp, and ulcer. Keep your bird warm and quiet until you can see your local veterinarian.